Today I came out of one of our showcase/demo sessions with a client and his stakeholders. These are usually the points in the project that we all look forward to. Increased collaboration with our clients and the proximity of their office to ours has meant that we have a great rapport with the client’s team and these demo meetings act as an opportunity to impress the client and for the developers to get a few pats on the back. However, today it was different. The client had brought in a new stakeholder and as we started the demo he put his hand up and said something that silenced me, he said “We don’t do it like that any more”. I was panicked and a little shocked. The guy apologised and clarified the position, “I’m new here I know but we’ve just been told by our supplier that we need to give them visibility on orders earlier in the sales pipeline, so the workflow needs reworking”. My initial thoughts were that of worry. In traditional projects a conversation like this usually has cost and time implications intrinsically linked to it and I was worried about what I’d tell the developers and my boss. Thankfully the team allowed me to complete my demo and then we got the whiteboard out and started reworking what we had implemented to help tackle this 11th hour requirement. By doing it in this way we were able to remain professional while being adaptive to change with the client. Today it all made sense. 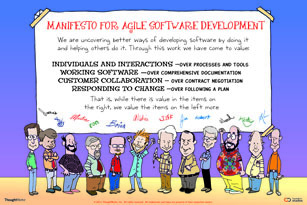 The agile manifesto was written to help people in exactly the same boat as I had found myself in. Previous Previous post: Do Business Analysts need technical expertise to be an excellent Business Analyst?